Stocks in Asia had another weak session on Tuesday as pessimism about global growth kept funds away from risky assets, with Chinese equities losing more than 1%. A couple of hours after China reported its slowest quarterly economic expansion since the financial crisis and the lowest annual growth in 30 years, the International Monetary Fund (IMF) decided to cut its growth forecasts for 2019 and 2020 by 0.2 and 0.1 percentage points to 3.5% and 3.6% correspondingly (from last October’s projections), adding more fuel to concerns that the global economy could come under stronger pressure in the coming months, if it has not already. Apart from China’s slowdown, the global lender which delivered its second downgrade in three months also cited weakness in Europe and emerging economies as key challenges, while not surprisingly, the institution believes that a failure to resolve trade conflicts and the Brexit saga could further destabilize welfare globally. 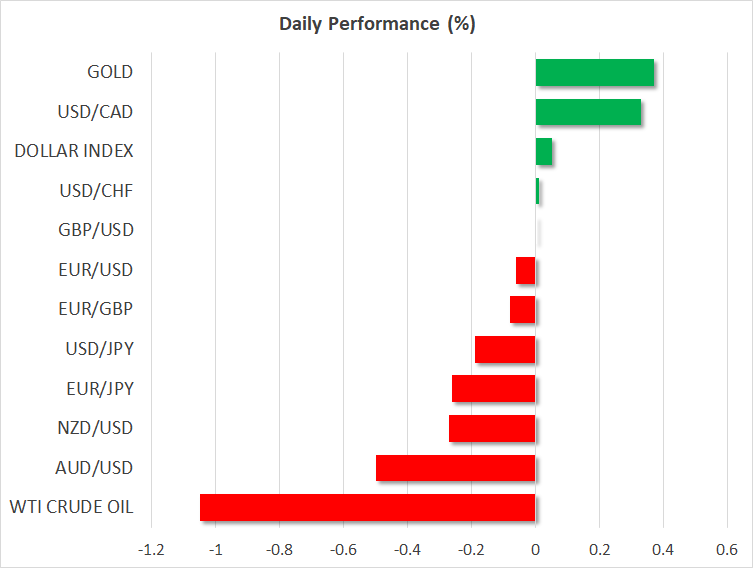 The gloomy news and the downbeat sentiment are likely enough to keep risk-off appetite front and center in subsequent sessions and persuade two key central banks to maintain their already-loose policy stance this week. Note that both the Bank of Japan and the European Central Bank are deciding on rates on Wednesday and Thursday respectively, but neither is expected to change its ultra-easy policy amid a low-confidence economic and political environment. The yen’s strength today, the selling in the risk-sensitive aussie, and the support around gold serve as evidence that investors are quickly responding to any signs of a hard economic landing. Yet whether this will be potentially a hard or soft landing is still a question. In Europe, the euro and the pound extended declines on Tuesday as Theresa May gave little detail yesterday on how she plans to change her Brexit plan which was overwhelmingly rejected by the British Parliament last week and particularly how she will address worries over a hard border between the Republic of Ireland and the British Province of Northern Ireland. While she reiterated that a no-deal Brexit is still possible and expressed willingness to continue seeking amendments to the Irish backstop from the EU, the missing clarity is expected to keep MPs in confusion next Tuesday when they will gather to vote on May’s modified Brexit deal version, and therefore buying interest for the pound muted. Oil was also a victim of global growth fears on Tuesday as the IMF’s pessimism reminded investors that demand for crude could follow a downtrend this year. WTI crude and the London-based Brent were erasing yesterday’s gains, falling by 0.78% and 0.81% respectively in the day. The OPEC’s supply cuts that started in early 2019, however, seem to have prevented bigger losses in the market. The World Economic Forum, which discusses politics, economic and cultural issues starts today in Davos, Switzerland. But the absence of the key leaders such as Donald Trump, Theresa May, .Emmanuel Macron and Xi Jinping who decided not to attend the event .because of the challenges they face at home could turn the meeting uneventful. Elsewhere, New Zealand will be reporting CPI figures for the fourth quarter later in the day, shifting some attention to the kiwi. In stock markets, the earnings season continues with IBM, UBS, and Johnson & Johnson being among companies to report quarterly results before the US open bell today.